Wandsworth, South West London, All Saints Church circa 1906. This is an early postcard by Young & Co of Teddington, signed RCY for Richard Charles Young. 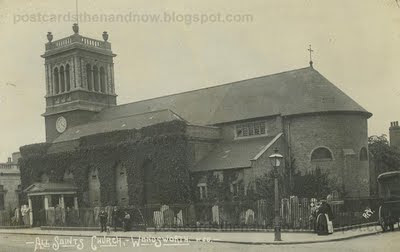 It is interesting how the church tower has changed. Click the postcard to enlarge. Since churches were so often photographed, they offer an interesting timeline of architectural changes. I like the way we also know the time of day in both the photo and Google Street View.